We would like to congratulate you on the acquisition of your new puppy. Owning a dog can be an extremely rewarding experience, but it also carries with it some responsibility. We hope these notes will give you some help. If you have questions concerning any subject related to your puppy’s health, please do not hesitate to telephone us. Is it small enough to live in your apartment or house? Do its energy levels suit the amount of exercise it will get? These are all important questions to answer to ensure the well-being of your puppy and the overall happiness of your household. Puppies love to explore with their mouths, so to keep your puppy and your house safe, you’ll need to take a few precautions. Remove breakable items from the area where you plan to keep your puppy. Keep all electrical cords raised or covered and close all low windows. You should also lock away cleaning supplies/chemicals that are toxic to puppies. Get a rubbish bin that is too tall for your puppy to get into and too heavy to be knocked over. Think about getting a folding gate to keep your puppy confined to a certain room or area. Click here for more Puppy proofing information. Two metal bowls. These are better than glass because they do not chip and stay cleaner. One for food and one for water. If you have other pets, be sure to give the puppy it’s own bowls to avoid conflict with other pets in your household. A puppy bed. Some options are: crate with a crate pillow, a snuggle nest, or a wicker basket with a lot of towels. Whatever you choose, make sure it is always soft, comfy, and dry. Also keep in hand for a blanket in case of cool weather. Make sure that your puppy has its own bed to avoid conflict with your other pets. Toys. Your puppy will be a ball of boundless energy, so make sure you get plenty of toys. You should have chew toys and soft toys . Make sure the toys are indestructible, if not your pup can choke and die. Also remember that you should not give rawhide to pups as a toy. It’s only for treats. Puppy treats. Make sure you get a variety: Crunchy and soft. The soft will be good for training, and the crunchy will help clean teeth. Puppy food: Do some research on dog food. Kibble, canned, home cooked, and feeding a raw diet are all options for a puppy. Make sure you buy a puppy food with no dyes or artificial flavours or preservatives in it as many dogs, like people, are allergic to these additives. Basic grooming tools. Get a bristle brush, comb, rubber gloves, nail clippers, dog shampoo, dog conditioner, dog toothpaste, toothbrush, and towels. A harness and tag. Get a nylon harness, and metal tag. Collars hurt their necks and can injure their throats. Remember when sizing the harness that puppies will grow. Get the puppy comfortable in your home. It can be scary getting introduced to a new home for the first time, so make sure to give your puppy extra love and attention the first few days. 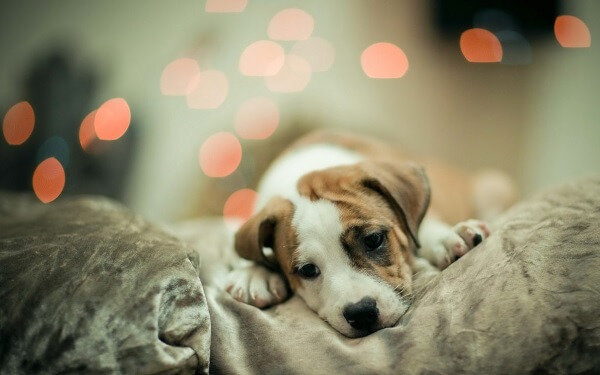 Have your puppy sleep in your room at night so that they don’t feel isolated or alone. Take a blanket or dog bed to the breeder or pound from which you will pick up the puppy. Do this a few days before you pick up the puppy so that your new companion can sleep on the blanket and begin to get accustomed to your home before it even gets there. Show your puppy around the house as soon as you bring him home. Let him walk in all the rooms and backyard. It’s important to stroke your pet’s body, legs, and head several times daily. This will help your puppy feel loved, as well as allow you to create a strong bond with your puppy. Handle your puppy with care. Puppies, like human babies, are fragile. Gently scoop up your puppy if you need to pick it up, keeping one hand under its chest at all times. Puppies are naturally curious, and even with the most attentive care they sometimes get out of the yard and get lost. Make sure your puppy wears a comfortable collar—fitted at about 5 weeks and loosened gradually to accommodate the puppy’s growth—with a tag listing its name and your address and/or phone number. Also we strongly advise to get your puppy microchipped to assist in locating it if it gets lost. Provide a safe area for your puppy to play. A securely-fenced yard is ideal and experiment a little to find which toys he or she likes best. While it’s tempting to go for the cheap stuff, this is generally not the best choice for your dog. Look for foods that incorporate high quality proteins from fish, chicken, lamb, and/or eggs. Also look for a way to feed your dogs fatty acids to keep its coat shiny and healthy. Generally, you’ll want to feed your dogs a ratio of 5:1 omega-6 to omega-3 fatty acids. This can come in your food or in supplements such as salmon oil especially designed to give to your dog. Click here for more feeding information. If you would like an idea how big your little puppy is going to be click here. Different breeds require different amounts of exercise (this is a factor you should consider when choosing a puppy). As puppies’ bodies are still developing, try to avoid any sort of rough play or strenuous exercise such as long (over 2 mile) runs. Take the puppy into the yard or garden after meals, and begin taking your puppy for short walks about a week after its second round of vaccinations. Try to give your puppy about an hour of walk time a day, broken into 2 to 4 walks. Allow them to interact with other (friendly) dogs they meet (assuming your puppy has had its shots) and to leave scent markings. This is important for your dogs confidence, especially if he is a boy. Socialize your puppy. Once vaccinated, puppies should be encouraged to play with friendly puppies, grown dogs, and other animals. 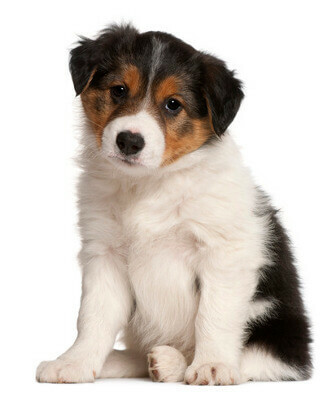 Make sure the other animal tolerates the puppy well, and do not leave the animals alone for even a minute at first. There are many diseases that are fatal to dogs. Fortunately, we have the ability to prevent many of these by the use of very effective vaccines. In order to be effective, these vaccines must be given as a series of injections. Ideally, they are given at between approximately 8 and 10 weeks of age and cover Distemper, Hepatitis, Parvovirus, Parainfluenza & Leptospirosis. In areas of high infection your veterinary surgeon may advise a further injection at approximately 12 weeks of age. It is also worth considering vaccination against tracheobronchitis, often known as kennel cough although this affects many dogs who have never been near a kennels. This vaccination can be carried out at the same time as the other vaccinations and is not an injection but involves drops inserted into the nose. Get your dog microchipped and have the assurance that should he become lost (or be stolen), he is more likely to be returned to you safe and sound.